The freshness of Ricotta is essential. It can be eaten as is, mixed until creamy with a little sugar and grated lemon zest, chocolate chips, raisins or dried fruit or whatever catches your fancy. Not to mention cannelloni or lasagna with ricotta and spinach, pies and cheese-cakes or stuffed pasta. We also recommend to try it for breakfast with a slice of toast and a hint of your favourite jam! Check out our recipe page. 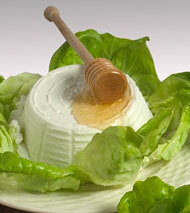 We are proud to tell you that our Ricotta has won the Gold Award at the ″2012 New Zealand Champions of Cheese Award″.